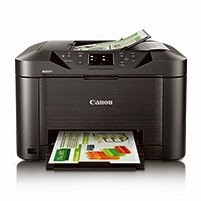 Canon MAXIFY MB5020 Driver Download - New high-speed Printer Canon MAXIFY MB5020 Small Office Wireless all-in-One Inkjet printer meet your heavy work. Canon MAXIFY MB5020 is designed to be able to meet the needs of small business users grow, it gives the user great business results: crisp, colorful prints of all Your business documents files with cost-effective and fast. With the Canon MAXIFY MB5020, success is yours to print. Print Resolution: Up to "600x1200" dpi /Scan Max. Resolutions: Optical: Flatbed: "1200x1200" dpi, ADF "1200x1200" dpi (Optical), Interpolated: "19,200x19,200" dpi / Ink Compatibility: PGI-2200 BK XL, PGI-2200 Y XL, PGI-2200 C XL, PGI-2200 M XL, PGI-2200 Y, PGI-2200 C, PGI-2200 M, PGI-2200 BK. canon-printerdrivers.com provides a download link for the drivers Canon MAXIFY MB 5020 directly from the official site, you'll find the download the latest drivers for this printer with a few simple clicks, without being redirected to other websites. Windows 8.1 / Windows 8.1 (x64) / Windows 8 / Windows 8 (x64) / Windows 7 / Windows 7 (x64) / Windows Vista / Windows Vista (x64) / Windows XP (x64) / Windows XP (x32) / Macintosh / Mac OS X v10.10 /Mac OS X v10.9 / Mac OS X v10.8 / Mac OS X v10.7 / Mac OS X v10.6 / Linux.